Yes, but first you must talk to your healthcare professional regarding your swallowing difficulties so that he or she can properly diagnose your condition. If you’ve been diagnosed with dysphagia, you will be given a customized plan. This might include exercises to improve swallowing function, as well as a modified diet to make eating and drinking more manageable. With these types of modifications, swallowing can be much safer and more comfortable, and help assure you get the nutrition and hydration you need to maintain your health. But that shouldn’t stop you from enjoying meals with your friends and family. You might have to avoid some items, but by modifying food effectively by pureeing and/or thickening, you can often continue to enjoy your favorite foods and beverages. When pureeing foods, the final consistency should be smooth and thick enough to scoop with a fork or spoon (very similar to that of mashed potatoes). To puree foods properly you’ll need the right equipment − common items which are probably already in your kitchen. A food processor works best or pureeing foods and achieving the desired consistency. However, a heavy-duty blender or hand mixer will also do the trick. 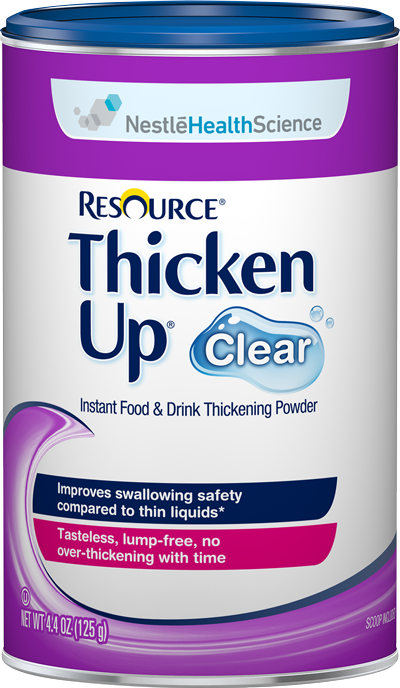 RESOURCE® ThickenUp® Clear is an innovative thickening agent designed to rapidly thicken liquids and food, for patients with dysphagia or swallowing difficulties. *Clinically shown to improve swallowing safety by reducing the risk of aspiration compared to thin liquid in dysphagia patients. Leonard RJ, et al. J Acad Nutr Diet. 2014;114:590-594.